I am trying to get a multi-wan working in my company's network, on a machine which is connected to an existing pfSense firewall. The reason is that I don't have to make any changes in the existing network until I am absolutely sure of it working. 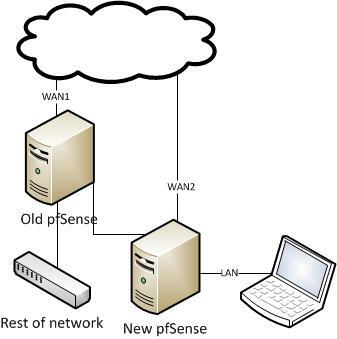 The WAN2 works fine and I am able to connect to the internet on my laptop, but I can only connect to the internet at WAN1 when I create a bridge between the interface that is connected to the old pfSense and the LAN interface that is connected to my laptop. And I don't think I will be able to loadbalance between the WAN's that way. Is it possible what I am trying to achieve, without the bridge? I don't think load balancing across 2 pfsense servers is possible. You can do that in 1 pfsense machine. You might be able to if that wire connecting the two firewalls is a WAN on the old pfsense … but it would not be able to load balance the other way though.